Don't forget to Change Your Clock, Change Your Batteries on November 4th! Be sure there is at least one smoke alarm less than ten years old installed on every level of your home, including one in every bedroom and outside each sleeping area. The International Association of Fire Chiefs (IAFC) and fire experts nationwide encourage people to change smoke alarm and carbon monoxide detector batteries annually. 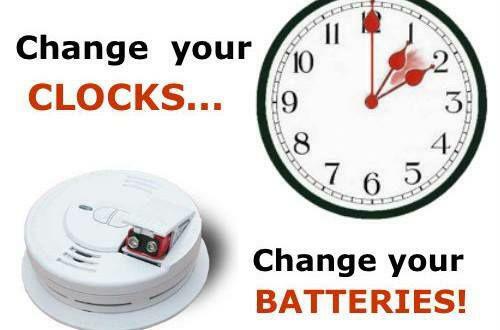 An easy way to remember to do so is to change the batteries in your smoke alarms and carbon monoxide detectors when you change your clocks back to standard time on November 1st. After inserting a fresh battery in each smoke alarm and carbon monoxide detector, push the safety test button to make sure alarms are in proper-working condition. Conduct this test monthly. Never disconnect your smoke alarm battery! Remember that a "chirping" alarm is a signal it needs a fresh battery. Ensure your smoke alarms' and carbon monoxide detectors' sensitivity by cleaning them each month of dust and cobwebs. The International Association of Fire Chiefs (IAFC) recommends replacing smoke alarms every 10 years and having a combination of both ionization and photo electric smoke alarms to keep you alert to all types of home fires. Keep flashlights with fresh batteries at your bedside for help in finding the way out and signaling for help in the event of a fire. members, children in particular, know what the alarms and detectors sound like and what to do should they go off. Change Your Clock, Change Your Batteries on November 4th! Source: Fire statistics were obtained from reports by the Fire Analysis and Research Division of the National Fire Protection Association. See www.nfpa.org for more information. Information courtesy of Energizer.